Suddenly, a white light filled the dark room. It drowned out the shadows, filling every corner of the room with its glow. For a second I couldn’t see a thing except for the brightness. I couldn’t feel a thing except the sharp pain- like a million tiny spikes all poking me at once. Then it was over with. It was done. I staggered off the platform, avoiding the smoke trailing from the still-hot laser ray. I felt different now. I was heavier, for one thing. And my vision was blurrier; the colors smudged at the edges, as if someone had dripped water onto a painting. I turned to face the screeching Scorpio, shaking in his oversized white lab coat. He was all too familiar to me; frizzy white mad-scientist hair, shockingly yellow scales, and thick black eyebrows that seemed to pop off of his face. “I’ve gotten past caring what I look like, Dr.... Dr....” I trailed off, realizing I had never quite caught the scientist’s name. He was ignoring me, though, still giggling to himself and re-energizing the laser for the next Neopet in line. I glanced at the pet. It was a female Gelert, colored a simple red and shaking from head to paw. It was probably her first time, judging by how frightened she appeared to be. I tried to feel empathy for her. No matter how deep I probed through my mind, though, I still couldn’t recall the first time I had been zapped by the Lab Ray. Not wanting to be around when the Gelert was changed, I hurried out of the Secret Laboratory. Outside it was bright and sunny on the strange island of the Lab. I took a deep breath of fresh air and hurried off to join my owner. Sasha was a rich Neopian. The only thing she loved more than Neopoints were what could be bought with them- and that was a lot of things, including paint brushes and weapons and impossibly expensive plushies. At the moment, she was surrounding by a crowd of awestruck newbies, telling them about her latest purchase- a Meepit. I rolled my eyes as I marched up to her. The newbies’ eyes widened with surprise as they spotted me. It was then when I realized that I didn’t even know what the Lab Ray had turned me into. I looked down at myself. I was large now; not fat, but just... huge. 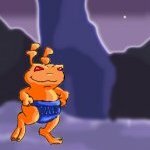 I was a Grarrl, for Fyora’s sake! On top of that I was four shades of red, all blended together to make an ugly camouflage pattern. I knew that it couldn’t camouflage a chameleon. It was just too shockingly bright! “Sasha, I’m your Neopet,” I said patiently, like I always did when she had a fit. “Oh... oh, yeah... well, Tom, you go... go do something else for now. I can’t... I just can’t deal with you at... at this minute.” She pushed me away, breathless from her imaginary inner struggles. I walked away. What else could I do? Sasha was a weird human, turned selfish from her money, but she was my owner. I loved her, and she loved me, in her own strange ways. I found myself wandering over to a group of Neopets. They were all talking excitedly. I figured they were probably the newbies’ pets, being zapped for the first time. I recognized the Gelert, now half orange and half purple. “The pain isn’t that bad after the first ten or twenty zaps,” I said casually. They all gaped at me, unable to speak. “You’re... amazing,” the Gelert whispered, awestruck. I could hardly hold in my laughter. This crew was funnier than anything! I wondered what they thought of me- a super-rare Neopet with amazing abilities, strength, wits, and knowledge. They probably thought of me as an idol. If only they knew the truth: I was an ordinary Neopet with blurry Grarrl vision and a serious addiction to the Lab Ray. I was not to be idolized; my position was not to be envied. I would trade to be them in a heartbeat. “Wow, I feel terrible for you,” said a new voice, interrupting my thoughts. I turned to see a brown Moehog with an expressionless face staring at me, smirking. “Why?” I asked, on the defensive at once. “What makes you say that?” I growled. The Grarrl growl was one of the best I had heard, actually... a deep rumbling from my stomach. It was much better than that feeble Yurble growl I had tried before. That brought me to a screeching halt. I had never thought about it that way before. Who am I? That was an impossible question to answer, or at least it was at that moment. I was Tom. But what else could I say? My character traits? I didn’t have any, really; I wasn’t especially generous or selfish or short-tempered or any of those things. “I’m Tom,” was all I could manage. “Who are you?” I snarled. All I could do was glare. “You, on the other hand, are Tom. But you’re not a Camouflage Grarrl. You keep on changing what you are. You’re a shape-shifter. Tom the Shapeshifter.” Raffi snorted. I narrowed my eyes even further, making my poor Grarrl vision even worse than it was. I felt rage bubbling in the pit of my stomach, threatening to explode. I had to do something, and quick. To save my dignity. “I like to get zapped,” I finally said. “It’s a personal choice, not an addiction.” I was lying through my teeth, but the others seemed to believe me. Except for Raffi. Dumb Raffi! Before I could even register what I was saying, I heard a deep Grarrl’s voice accepting. And all I could think was, What have I gotten myself into? The next day, after I had gotten zapped for the last time that week, I went out to meet Raffi. He was there, standing underneath the tree we had chosen to meet by. The warm summer sunlight filtered through the green leaves of the tree. It seemed like it was positively glowing. The sky was a radiant blue, speckled with puffy white cotton-swab clouds. Everything looked wonderful. This just made my mood worse. It was like the world was mocking me. The Brown Moehog looked me up and down. I glared at him. Maybe two years ago, becoming a Maraquan Cybunny would have been a cause for celebrating. Sasha had certainly been happy when she had seen me, saying in that silly, narcissistic of hers way that she had never loved me more than when I grew fins. But it was different now. I was already itching underneath my waterproof scales, wanting to change again. The thrill of discovering who I was had sunk its hook into me, and I was addicted. How could I stay the same for a week? Even if I was Maraquan? “It doesn’t matter what you say,” Raffi said. “Time starts... now.” With that, he pranced away, darting under the cover of the trees behind. I knew that for the next week, I was doomed. Sasha’s voice rang out softly in the crowded restaurant, chiming in with the clinking glasses and chewing Neopets. She ducked her head to take a spoonful of the creamy herb-speckled soup before her. I stared at my own soup. It rested in a neat bowl made of coral, with a shrimp tucked into one side. I pulled out the shrimp and turned it in my fingers, trying to hold in my disgust. Cybunnies did not eat other animals; they were vegetarians. And I had to stay like this even longer? It was the last day of the bet, and I was already feeling completely miserable. “Oh, yeah, shrimp isn’t your thing,” Sasha said, leaning back in her chair. “Should I call the waitress to exchange it for a vegetarian appetizer? I’ve heard that the Pate A La Kelp is excellent.” She took a bite of her own shrimp and looked around happily. It was true that Kelp was a beautiful restaurant. Deep under the waters of the Neopian oceans lay Maraqua, the underwater city ruled by King Kelpbeard. Inside of Maraqua was the building of Kelp. It was a seafood restaurant, decorated lavishly with coral, shells, and of course, kelp. The food was delicious, but about as expensive as a dozen Meepits. “All right,” she replied. Sasha waved her small human hand, and in a second, the Maraquan Uni waitress had appeared at our side. The waitress nodded and took our food, replacing them with the menus. Sasha immediately bent over it, reading out the names of the dishes. I tuned my owner out and focused on the small waterfall that we were sitting next to, constructed of a thin stream of water gushing over pearly-white clams. The calm sound of the water was slowly soothing my tangled nerves. It had been awful so far. I had been gawked at, day after day, just because I was Maraquan. I had also received more than enough invitations to special Cybunny guilds. Even a simple stroll through Neopia Central could turn into a disaster. One time we were followed by a horde of Maraquan wannabes, straight into Hubert’s Hotdogs, where I stared at the menu until I felt like bursting into tears. Oh, how I hated that Moehog! I looked back at Sasha, who was ordering now. She seemed utterly at ease in this place, throwing her money away on fish, of all things. I scratched my scales, which had been growing dry from lack of water, and watched her. “...I’ll take the Whole Roast Pheasant, and he’ll take the Luxurious Vegetarian Star Pie,” she said. I jerked the chair backwards and rose to my feet. I had enough of this, this wastage of Neopoints. Buying expensive Secret Laboratory pieces and splurging on Meepits was one thing. But this... this... this was disgusting! When there were hungry Neopets out there, trying to make suppers out of Breadfish from the Money Tree, we were spending over a hundred thousand Neopoints on one very expensive dinner. Without another word, I rushed out of the restaurant. Out in the water, I felt much more comfortable, and drifted around lazily. Somehow, I wound up at the Maraquan Ruins, floating around in the wreckage. Seeing all of the destroyed buildings seemed to quiet my fury. Swimming was the only perk of being Maraquan. I didn’t have to put an ounce of effort into staying afloat. It came naturally, like breathing. Around me were a handful of chattering tourists. From the look of their patched potato-sack clothes and chapped Mortog-kissed lips, they were from Meridell. I darted into the shadows, instinctively knowing that if they caught sight of me, I would be lost in the flash of their cameras. The Neopets- a Kacheek, a Meerca, and an Usul, had ignored the warning signs put up by cautious Maraquans. All three of them had crowded by the edge of the Whirlpool. They were jerking each other aside to get a better look at the swirling waters. “Well, Sen, yer so skinny, yer annoyin’ me!” he cried back, returning the shove. The small blue Kacheek between them was ignoring them, trying to take a picture of the whirlpool instead. Suddenly, she slipped on a patch of seaweed on the edge of the water. She wavered in the air, on the brink of falling. Her eyes widened. Her ears twitched. I felt my heart race- but then she caught her balance. The Kacheek let out a sigh of relief and staggered backwards. With a grunt, he shoved her forwards. Jade was falling in slow motion now, held up by the force of the pulsating water. She let out a scream of terror just before she went under; her small mouth widening and that awful sound ringing out. Suddenly she was gone. She had disappeared into the whirlpool spinning round and round. “PULL... HER... OUT!” the yellow Usul bawled. Before I knew what I was doing, I felt myself swimming again. Easily I darted from the darkness and hovered in front of the whirlpool, trying to figure out how to save the Kacheek. Sen and Chug stopped arguing as they realized I was there. Jade wasn’t going down without a fight; I could give her that. She was struggling against the current, but it was no use. She wasn’t strong enough. I plunged into the water. As soon as I had entered the Whirlpool, I knew that it was different than the still waters above. This water was churning around in a circle, dragging me down with it. It was almost like it was angry. The force was overwhelming. Only a Maraquan pet could manage it- barely. Avoiding the huge bubbles that were blowing up from the center, I dove even deeper. I could make out a blurry blue figure ahead. It was still. Jade had stopped struggling; she was unconscious now. I stretched out one slippery fin and seized one of her short limbs. I forced myself to swim upwards, but it was impossible. The water was pulling me downwards, into its murky depths. How was I going to get Jade up? And myself, for that matter? Suddenly, I got an idea. I reached out and seized one of the long pieces of kelp on the sides of the Whirlpool. The kelp was lightweight and hollow- perfect for floating. I felt myself drift slightly upwards as the kelp rose. It was lighter than the water. It could float! I grabbed another one, and another one after that. Slowly, the combined power of the kelp was sending me rocketing towards the surface. I let out a triumphant yell as I broke the edge of the water, carrying Jade back into the safety of the thinner oxygen-filled water above. I was about to smile, but then I realized the voice wasn’t cheering for me- it was yelling. Yelling my name. And it was angry. Furious, even. Why was it furious? “What?” I asked, confused. “I was... I saved Jade!” I turned and gave a pointed look at the Meridellians. Sen and Chug had bent over the Kacheek, who had opened her eyes and spat out some water. “That food was delicious,” my owner snapped back. I stormed away from Sasha and the other Neopets, only wanting to get away from the Whirlpool. I let myself float higher and higher until I broke the surface of the ocean. Up above, the sky was black. Faint white stars twinkled in the darkness, like tiny beacons of light. I pulled myself up on the sandy shore and looked around. I was sitting on a beach of some kind. Beyond the trees, there was a crowded complex of colorful buildings. An abnormally large tree. And the smell of hotdogs. I jumped to my feet and hurried past the trees, going straight for the Money Tree. Since night had fallen, the grungy Neopets who were regulars of the Tree had pulled up their soggy boxes and fallen asleep. I crept up to the base of the trunk and examined what was lying around. A Soggy Old Box, a Broken Fishing Pole, a Rusty Old Can, some Moon and Star Stickies, Dung Jelly, and of all things, Carawool. Nothing at all could be useful to the poor Neopians. I pulled out my wallet and tossed it into one of the boxes. There. I had done it. I had donated to the Money Tree. Somehow, this ignited a small, warm flame inside of me- something comforting and familiar. It made me feel good. I felt as if I were glowing as I wandered around Neopia Central. It was so peaceful at night- much unlike the crowded, busy way it was in the morning! As if fate had called it, I ended up at the Neopian Pound. I was almost scared of going inside- almost. I passed the cages in the Adopt section. Unlike the rumors had said, the Neopets here were not nightmarishly skinny or diseased. They looked like normal Neopets. But they were tired. Not as if they had had a hard day at work, but as if they had grown weary with life altogether. And to me, this was much, much worse than having a mild case of the Sneezles. I spun around to face a small green Aisha watching me intently. “And not you?” I asked, feeling a pang of sadness for the stranger. Suddenly, as the clock struck twelve, I knew just what to do. Suddenly, a white light filled the dark room. It drowned out the shadows, filling every corner of the room with its glow. For a second I couldn’t see a thing except for the brightness. “What did you get?” I called excitedly, hurrying to the edge of the railing. Behind me, a Brown Moehog re-energized the Lab Ray for the next Neopet in line. “Glowing!” replied a delighted voice. As the smoke cleared, I could see a bright green glow coming from the Blumaroo. I patted him on the back with one of my fins and he turned his grinning face to mine. “Thanks so much!” he cried. “I know for a fact that I’ll get adopted today. In fact, I heard that one of the Neopians in town was looking for a glowing pet!” As happy as you could get, the Blumaroo hopped out of the Laboratory. As the next Neopet stood under the laser’s beam, I re-joined my lab partner at the top of the platform.